Will Japan Meet Australia’s Submarine Needs? The prospect of Japan helping Australia replace its aging fleet took another step towards reality last week. Australia needs new submarines. That much is clear. Where these subs are to come from and where exactly they will be built remains far less clear. Last week Japanese and Australian media reported that Japan may in fact supply or at least assist with Australia’s new subs. This was met with fairly predictable outrage: Aussie subs should be built in Australia. “Our next generation of submarines should be built in Australia, using Australian steel and the world class expertise of Australian workers – anything else is a compromise and a broken election promise,” said Jack Snelling, South Australia’s Defense Industries Minister. Australia currently has a fleet of 12 Collins class subs that date mostly from the mid-1990s. They are diesel-powered and the new fleet will be “conventional” also, according to the 2013 Defence White Paper published by the previous government; nuclear subs are to stay off the cards. And, as re-stated recently, there will be no off-the-shelf purchase of Japan’s Soryu subs, but there may be a joint collaborative project with Japan. There is a wider angle here that Japan hopes will increase defense ties with Australia and also increase trilateral relations with the U.S., too. Right now relations are what Japan is apparently referring to as a “quasi-alliance.” Security cooperation between Japan and Australia has been growing of late, as has economic cooperation with last year’s free trade agreement. A widely quoted survey by the Australia-China Relations Institute did find, however, that Australia has no interest in defending Japan against China, even if the U.S. asks it to do so. As pointed out in a recent article in The Monthly, Australia has different needs for its submarine fleet than other nations: Typically they have to travel far greater distances than those of European nations, many times in some cases. In fact, to protect all strategic interests Aussie subs have to traverse some 20 percent of the world’s surface. 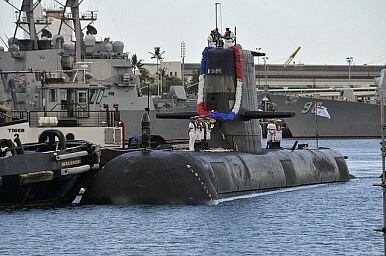 “Japanese subs do not meet Australia’s unique requirements, and their much-touted air-independent propulsion is actually Swedish technology that would have to be bought directly from Sweden,” said The Monthly. The lengthy article is worth reading in full, but the author Claire Corbett makes the point that many civilians see a naval force in terms of border defense and of offering support in far-flung wars. Certainly the endless hay-making by politicians when discussing protecting sovereignty and borders from refugees arriving by boat gives the polity the idea that this is one integral operation of the Royal Australian Navy, but really, it is about trade. The Navy, its submarines, must not only patrol waters from hostile forces but also protect the trade lanes in the Asia-Pacific where so much of the world’s trade is done. Trade is, as this publication has made clear many times, not the only factor but it is one often overlooked in favor of “sexier” angles in much public debate. Many Asia-Pacific nations are also engaged in buying new submarine fleets from Bangladesh and Thailand to Vietnam, whose purchase of six Russian kilo-class subs was seen as a shoring up of power in light of more South China Sea spats with China.